We are now accepting orders from abroad (click “add to cart” above) and shipping via airmail. The first 300 books are signed by the author (this website only). The signed books are sold out. Steve Jansen, ex. 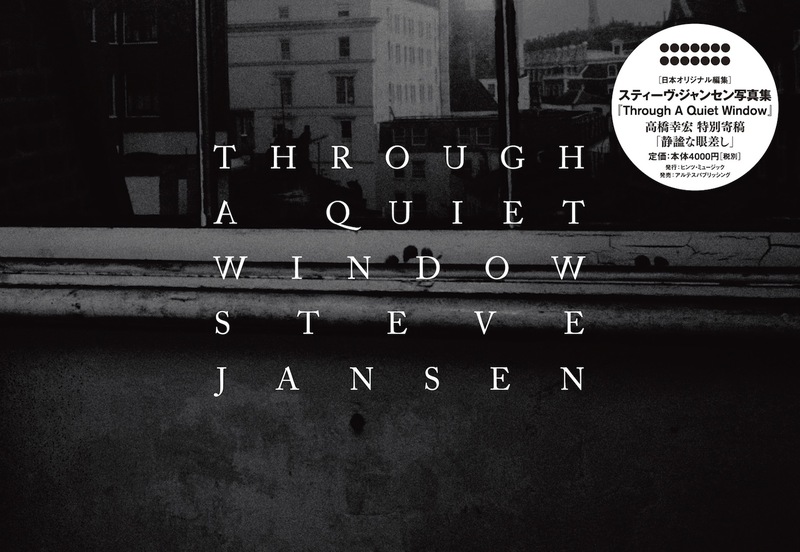 drummer of JAPAN, a group acclaimed for the albums “Gentlemen Take Polaroids””Tin Drum” & other significant works in early 80s, will release his first long-awaited photobook “Through A Quiet Window” in September. Most of the photos were shot between 1981 and 83. Readers will be able to gain deeper insights into the members of JAPAN – David Sylvian, Mick Karn, Richard Barbieri, Rob Dean – during their tours and studio recording sessions along with YMO (Yellow Magic Orchestra) members Yukihiro Takahashi, Ryuichi Sakamoto, Haruomi Hosono, and the final member of JAPAN, Masami Tsuchiya etc.. It contains 170 images consisting mostly of monochrome prints, but also colour and a selection of Polaroids. Some texts by myself appear in the book as well as a contribution from Yukihiro Takahashi who has produced the book via his Hints Music publishing company. He and I together wanted to make the images that have been featured online (as well as others never before published) available in an art book format. The book is compact and beautifully presented by Japanese designer Keiji Terai and is being printed and manufactured in Japan. Price including shipping for international sales. You can pay by Paypal or credit card via Paypal. ★The first 300 books are signed by the author. The book is priced at 4000 yen in addition to shipping costs. Born in London in 1959, Steve along with brother David (Sylvian) began making music together as young teenagers, and later with school friends Mick Karn (bass) and Richard Barbieri (keyboards) they formed the group JAPAN. Their recording careers commenced in 1978 and initially the group found success in the country of Japan, followed later in the UK and Europe. Due to the band’s unique sound and sudden disbanding in 1982 after completing their fifth studio album and at the height of their success, JAPAN have maintained a cult status until today. Many compilations have since emerged over the years. Steve went on to collaborate with a variety of other artists producing many studio and live albums and world tours. Writing partnerships developed with all the ex-JAPAN members individually, as well as with Yukihiro Takahashi (YELLOW MAGIC ORCHESTRA). In 2007 Steve released his debut solo work ’slope’ and he continues to work as a composer and musician as well as in production and mixing.